In Amsterdam, Santa doesn't have Elfs or even little helpers he has Golliwogs! 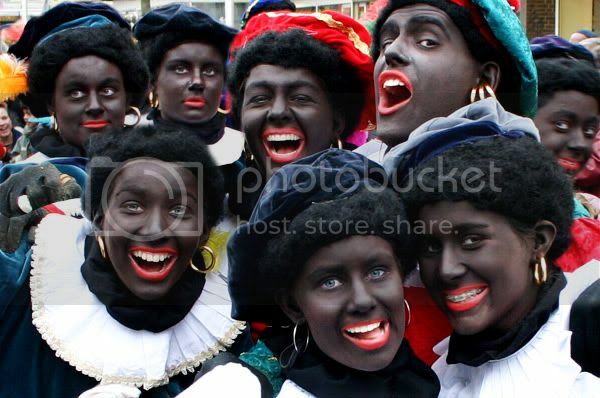 Or as they are traditionally called "Zwarte Piet" which loosely translates to 'Black Pete', however with blacked out faces big red lips, white teeth and afro wigs they are pretty mum life size golliwogs. Everywhere we went in Ams we stalked by Black Pete dolls hanging in the butchers windows, toy stores, supermarkets, on cakes, even on a snickers advert! It's Amsterdam's best kept secret, and I definitely know why. Back in the day, if Santa did have 'helpers' I'm pretty sure they didn't get paid cause they were probably slaves, stolen from their homeland and imprisoned in the cold arctic. Even still, get with the times Amsterdam- gone are the days of the minstrel show, slavery was abolished years ago, minimum wage exists and the cheapest labour is probably now from eastern europeans. 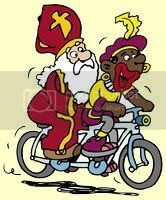 It was just bizarre to realise that Amsterdam was left behind when the world realised racism especially public racism is not right, yet the dutch think that blacking yourself up in the name of christmas fun is cool?! 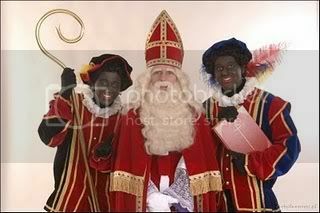 Please just google image search "Zwarte Piet" to understand the extent. Then tell many others to stop this from being Amsterdam's dirty little secret and force a change.